Penn achieved culinary satisfaction last night. Last month, the Quakers played against Penn State Brandywine, a campus of PSU and a non-NCAA school. They won easily, 99-40. They did it again—in their very next home game. Last night against Delaware State, a lowly team but an actual NCAA Division I squad, the Quakers topped the century mark in a 105-52 win. Ray Jerome hit a three-pointer with three minutes to play to hit the century mark. 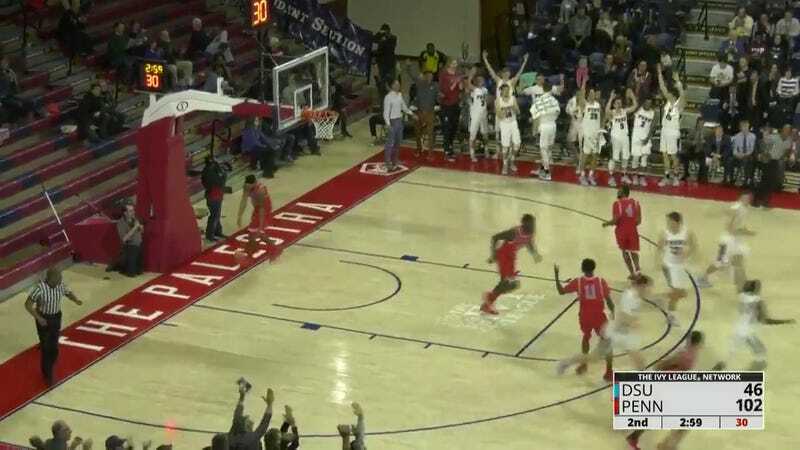 He joins Nate Allison (1996), Dan Solomito (2002), Patrick Lang (2004) and Brian Grandieri (2006) in Penn lore as the men who hit a cheesesteak-winning shot. Penn is now 9-4 and is by one measure the favorite to win the Ivy League (it’ll probably be Princeton, though). The Quakers take 41 percent of their field goals from three-point range; they shot 52 percent from behind the arc last night, setting a record for margin of victory against a Division I opponent. Penn has scored 101 (in a four-OT win over Monmouth), 99 and 105 points this season. After last night’s win, they’re averaging 80 points a game. Per the box score, 2,011 fans attended last night’s game. And thanks to City of Basketball Love’s Josh Verlin, we know how many turned up at Abner’s for cheesesteaks. So, about a five percent tickets-to-cheesesteaks rate. Pretty good deal for Abner’s, honestly—especially since they hadn’t had to deliver for more than a decade until last night. But at the rate Penn is scoring this season, who knows: More free cheesesteaks could be on the way. Would It Kill These Candidates To Eat A Frickin Cheesesteak?